Terrific! Artillery will broaden our campaign nicely. Welcome aboard! I am in. I believe I have a PLZ aircraft somewhere in my stash. Yes! I love the PLZs and look forward to seeing you build it. There was also a kit of a Polish twin engined bomber out some years ago. That would also make a neat subject. This twin-engined Polish bomber is PZL.37 Łoś (elk,moose in English). Thanks Radek, that is indeed the aircraft I recalled. It was a very sleek modern design for 1939. Welcome to everyone who has signed up for the Poland 1939 campaign! We have 20 builders now with ships, aircraft, tanks & even a balloon project in mind. I was curious if the Soviet T-35 five turreted monster might have been used in Poland. From what I have read, the answer is no. They were old and gave a lot of mechanical trouble and so they were left at home. The T-28 medium tank with three turrets was used. What German tanks would be suitable for this campaign? And any of the command modifications for listed vehicles. Yes, this list looks reasonable. Also some of the armored cars & half tracks were used along with trucks & autos of various sorts. I have this kit, but I guess it won't work because it's a J? Sorry to say that, Dustin, but none of the kits will fit the campaign's main rules... Both tanks were introduced in combat later than 1939. Dustin - Those are both tanks used later in WW2. 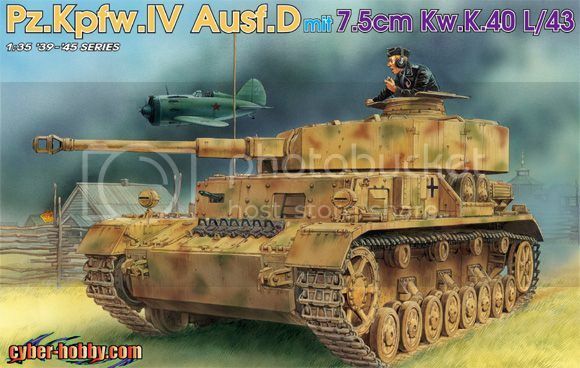 The Pz IV D is the right model but not the right version. The colors would be grey & brown or all grey. The dark yellow was still in the future. Wow. 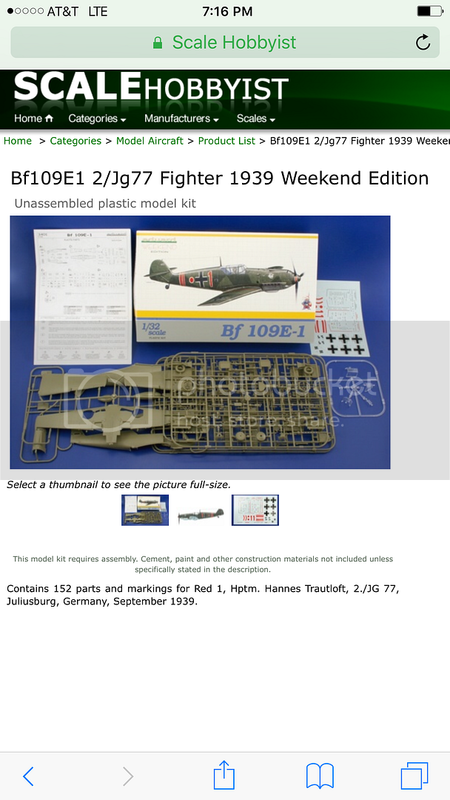 Scalehobbyist doesn't have a very good selection of early war stuff. Were the ME109's used during this time period? Any German armor with the white or yellow solid cross on it. As for me I am considering a Pzkpfw II or III or even digging out an Airfix Do-17p which has the "first kill" markings in it. There are plenty of good kits out from Dragon, Hobby Boss, Tamiya, Trumpeter and other companies. 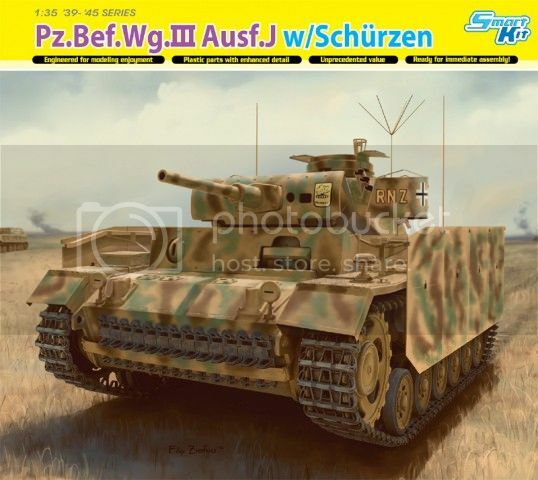 For a quick easy build you can't beat the Tamiya Panzerkampfwagen II Ausf. C, Sd.Kfz.121, Polish Campaign, kit number 35299. There are plenty of others out there, I mention this one only because it is readily available and even has the correct decals. Nothing much, and does not explicitly state as deployed for the Polish campaign, but it gives an idea on the organization and assigned armor as of 1939-40 period. Will keep looking. Dustin, the link Paul referred to may give you an idea on German and Polish armor employed during the campaign. Thank you for this list, it helps with choices. There are also so very detailed Mini Art Kits of the early Panzer IIIs that would have been used in the Polish campaign. Don't forget captured equipment. Both sides would have used it where they could get it. Thanks Tat, more excellent choices! I have seem pictures of the T-26s & T-27s. The T-28 book mentions they were used as well. One of my favorites, the BT fast tanks were also used and the are kits from Zvezda and Tamiya and possibly other makers readily available. I just got a couple of armored cars, the BA-3 & BA-10 kitted by Hobby Boss and they look very good in the box. Trautloft's Red 1 is a nice pick Dustin, I'd go for it! The early war Panzers just don't peak my interests, so this plane is a welcomed build for me, because I've been wanting to build a ME109 for awhile now. Question, BF-109E-B4, is this plane too late for the war in Poland? I'm not sure, you may have to do some research. Your 109 E with Trautloft's Red 1 markings was perfect, September of 1939, assuming he was engaged in the Polish campaign. The idea here is Poland 1939 so markings need to be those of participants or LIKELY participants. Both the equipment and the markings should be likely participants. Given the fog of war and the passage of decades we may have to go with our best guess in some cases. Above all, this is an excuse to learn a little history and enjoy building a model to help bring it to life. 10-4 Paul. I'll do some research and see if he was in that campaign. The research just adds to the depth of your enjoyment. Without the backstory or history, our models are just lifeless objects. With the historical context, our models become story tellers.